Ramadan is the month of the blessings and forgiveness! 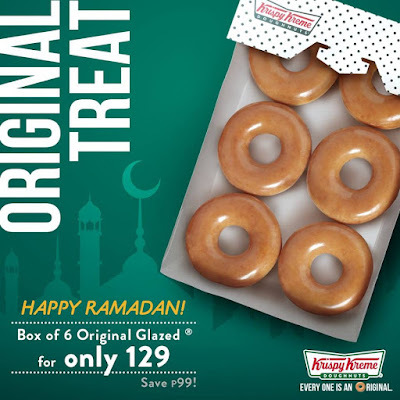 Share your blessings with Krispy Kreme's Ramadan Promo happening in all Mindanao stores. Buy half dozen Original Glazed for P129 only! • Promo runs until June 16, 2018 from 5pm onwards. • In the purchase of goods and services which are on promotional discount, the senior citizen can avail of the promotional discount or the discount provided under the expanded Senior Citizens Act of 2010, whichever is higher.